Hey everyone, it is me Autumm. Maybe it was the cryptoparty with Audrey and Bill, maybe it was knowing that Chris Gilliard was bringing students, maybe it was because Philly is not that far away from my home in Columbus, maybe it was because I’ve never been to Educon before and I wanted to check it out. 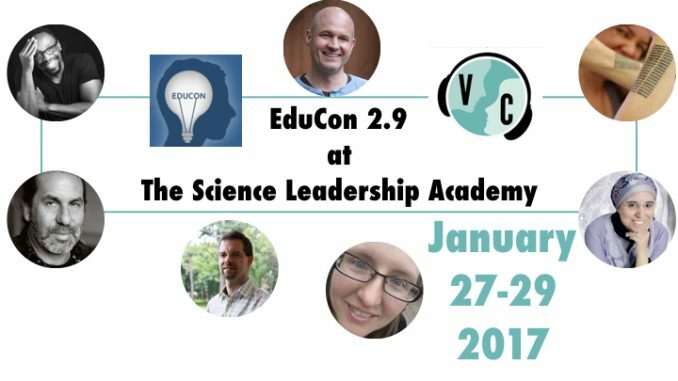 Well for whatever reason I decided at the last minute to go to Educon 2.9 and so I sent a shout out to see if any VConnecting folks were interested in me throwing together some sessions to make some connections – some virtual buddies jumped in and so here we are. Saturday January, 28th from 4:30pm till 5pm EST virtual buddy CogDog – Alan Levine can help you connect with Chris Gilliard and some of his amazing students who are presenting at the conference on Digital Redlining. Sunday January, 29th from 2pm till 2:30pm EST virtual buddy Ken Bauer will be helping virtual participants (that’s you) connect with Audrey Watters and Bill Fitzgerald. Did I mention that Maha Bali is backup buddy and could pop in for either or both of these sessions! Seriously folks, these are primed to be some great conversations and I’m in contact with some others at the conference too so we never know who might pop in. Want to join us – here is what you do. Let us know – tweet at us or reach out to the virtual buddy of the session that you want to be in directly or leave a comment below. Remember that we embrace spontaneity and so our sessions can start a little late or go a little long depending on how the day is progressing. If you would like to join by watching rather than actually being in the conversations you can just use the players above. If you would like to watch and tweet at us @VConnecting with questions that is always welcome as well.